On a Sunday in June two years ago I visited my pen-friend Stephen, a survivor of the Black Saturday bushfires of February 2009. We’ve been pen-friends for about a decade and have only met a few times. We cleared away the cobwebs of conversation by meeting at the St Andrews oval and having a kick of the footy. Loosened up by the exercise, we talked footy and family and music and work and life and more music. There’s no scoreboard at St Andrews (there hasn’t been a club for quite a few years) but Stephen indulged me by taking me to the Panton Hill ground (where we also had another kick) and the Hurstbridge ground. 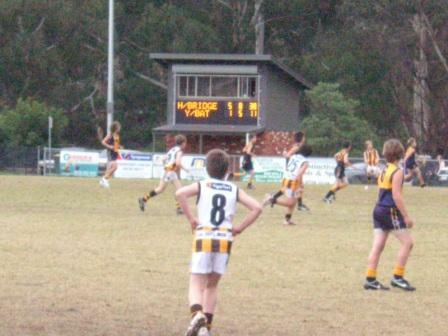 The boy in the number 8 jumper kicked a goal for Yarrambat shortly after we arrived at Hurstbridge. Stephen then took me up over the mountain, to Kinglake. We drove the winding road slowly, taking in the devastation of the February fires. The raw, black hills. ‘Like burnt wombat mange’, said Stephen. The caravans in place of houses. The For Sale signs in front of charred gates. Or nailed to charred trees. Flashes of green amongst the blackness. We talked, but not much. And not about footy.